Artifacts by Mary Anna Evans, a Mysterious Review. 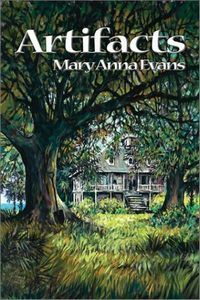 Review: Mary Anna Evan's first book, Artifacts, introduces Faye Longchamp, an archaeology student who finds herself enmeshed in a murder mystery while trying to save her ancestral home. This is an exceptional mystery filled with fascinating and original characters and unique settings. Evans' attention to detail is extraordinary, but never gets in the way of the story. Her effective use of historical narratives scattered throughout serve multiple purposes, not the least of which as clues to the mystery. Artifacts is possibly the best mystery by a new author published this year, and should be a part of every mystery reader's collection. Acknowledgment: Poisoned Pen Press provided an ARC of Artifacts for this review.